I have to be real honest. Meatballs kinda gross me out! Like, I would never go to an Italian restaurant and choose the "meatballs" on the menu! If we get down to the nitty gritty, I'm all around a finicky farmer when it comes to meat! Period! Just the thought of biting into a rubbery or grissley piece of meat makes me want to GAG! Okay, so now that I've made you lose your appetite, here's some good news! Several years ago when I was working as a corporate chef I made a meatball recipe to give the execs I worked for a bit of variety! And this recipe has stuck with me ever since!!! Perfectly seasoned and tender! I LOVE these balls!!! ;) And believe me when I tell you, that says a lot!!!! And they are so easy to make! Once the ingredients above are mixed well, roll into 1 1/2-2 inch in diameter balls. Put in a frying pan over medium high heat to brown slightly and lock in juices! Take a jar of your favorite spaghetti sauce and poor half of the jar into the bottom of your empty crock pot. 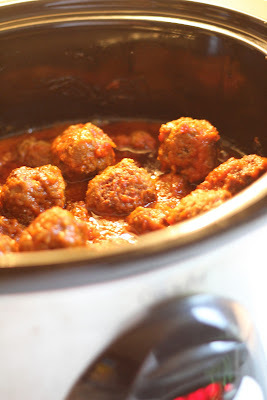 Then put your browned meatballs in the crock pot and cover with the other half of the sauce. Cook on low for 4-5 hours! It's all about the slow cooking with these little gems people! Don't try to rush perfection!!! Enjoy with your favorite pasta!!! Make sure you have extra sauce on the side! 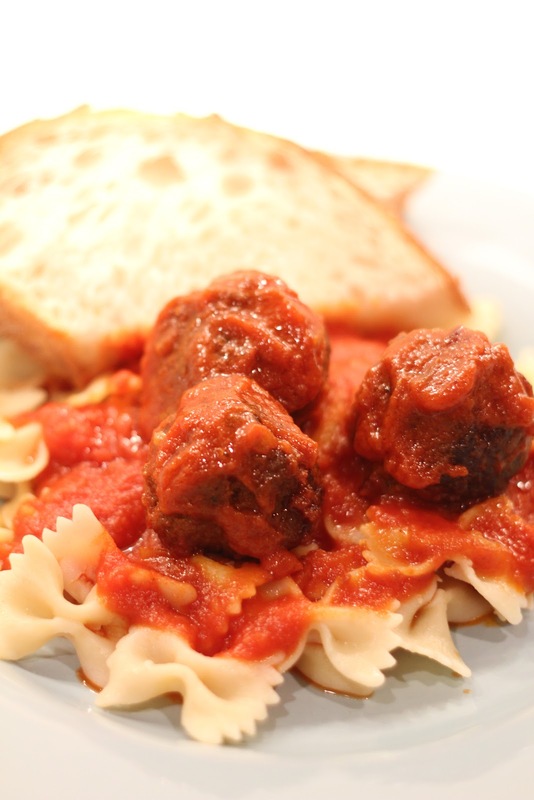 The recipe above makes roughly 35 meatballs, which serves about 7-8 hungry people!!! How funny that you posted about this today. I was just telling my mother-in-law that I might make meatballs tonight. I've never attempted them because I don't really crave them and like you, wouldn't order them at a restaurant. Thanks for the recipe! I am Breanna Ellignsons sis in law and I have to tell you I LOVE your blog! You give great recipes and have the best ideas. Your Asian Noodle Salad is one of my favorites! I am excited to make your strawberry cream cheese frosting for our Relief Society birthday party this Thursday. I know it will be a hit! These were a HIT tonight! Thanks for another great recipe! Everyone was raving about the flavor! I have to agree meatballs usually gross me out till I had a Moochies Meatball sandwich in SLC and thought I had died and gone to heaven! Ever since my husband and I have been hooked! I will definitely be giving these a try! Thanks Shelley! And I must say, Bre has sent me different links to your family blog!!! You are an excellent writer! And so witty/funny!!! Thanks Muriel! I've never heard of Moochies! But if you're convinced, I may just have to look them up next time I'm in Slc! !